If you have any questions about the SEABLUEZ information page below please contact us. Motor yacht SEABLUE’Z is a luxury yacht built by the respected builders Benetti yachts in 2006, measuring 36,57m (120 feet) in length and accommodating up to 10 guests in 5 attractive staterooms. The yacht is a great example of the Benetti quality, she is well equipped for audiovisual and water sports activities, with air conditioning throughout. Motor yacht SEABLUE’Z has a traditional interior, tastefully decorated in cream, taupe and charcoal, with modern wooden cabinets and paneling throughout. Luxury yacht SEABLUEZ has a good sized main salon with a central bar and a formal dining area forward. On the upper deck, there is a more intimate sky lounge with a large comfortable sofa, a further bar area, a chess table and a flat-screen TV. Yacht SEABLUE’Z has good deck space on three levels, offering a variety of settings for dining and outdoor living. There is comfortable seating and a dining table aft on the main deck, and a further large dining area on the upper deck, with inviting wooden sun beds aft and gym equipment forward, for that morning workout. The sun deck has a large bar area with tables and chairs, where you can enjoy drinks and snacks while taking in the view, or you can relax on the ample sun pads, or sip a glass of cold champagne in the bubbling Spa Pool further forward. The SEABLUE’Z yacht is well stocked with audiovisual equipment, including WiFi / Internet, TV, DVD and CD players with good libraries. If you enjoy water sports, motor yacht SEABLUEZ offers a great range of activities including an 11m Scorpion Tender with Bimini, a 7.2m Ribtec, 2 Topper Sailboats, a Seabob, Water Skis (adult and children), Wet Suits in a variety of sizes, Wakeboards, snorkeling equipment, and a range of Inflatable Toys including a Trampoline, a Donut and a Crocodile Banana. Rendez-vous diving is also available by appointment. 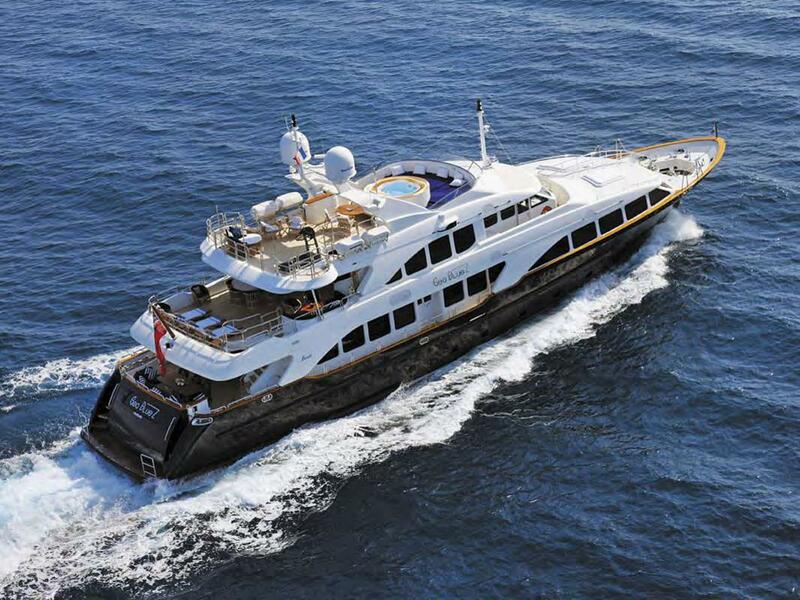 M/Y SEABLUEZ measures 36.57m (120 feet) in length, with a beam of 7.8.m (25.8 feet) and a draft of 1.95m (6.4 feet). SEABLUEZ has 8 crew and cruises at an average speed of 14 knots. Benetti yacht SEABLUE’Z is able to accommodate a total of 10 guests in 5 staterooms including a Master cabin, a VIP cabin, a Double cabin, 2 Twin cabins, all with ensuite facilities. 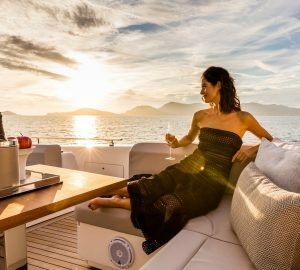 The luxury yacht SEABLUEZ displayed on this page is merely informational and she is not necessarily available for yacht charter or for sale, nor is she represented or marketed in anyway by CharterWorld. This web page and the superyacht information contained herein is not contractual. All yacht specifications and informations are displayed in good faith but CharterWorld does not warrant or assume any legal liability or responsibility for the current accuracy, completeness, validity, or usefulness of any superyacht information and/or images displayed. All boat information is subject to change without prior notice and may not be current.